When bows and arrows or knives and spears were the latest bone, bronze or iron weapon, herd animals had strategies more suited to wolves and other predators than the running ape. To counter the latest military-style rifle, elk (in Europe and Asia, the red deer) would have to steal blueprints from commy spies. Instead their evolutionary progress will now be down, in hunting areas, to the slowest and least conspicuous animals' survival. 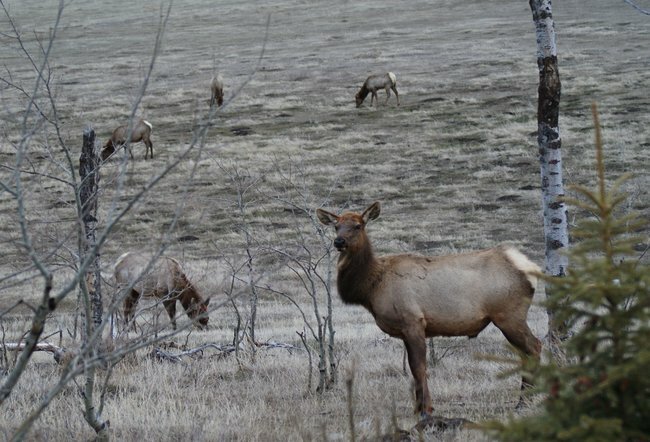 The University of Calgary, the University of Alberta and the University College, Dublin, are keen to research the elk and its artificial selection by hunters. Rapid evolutionary change is created by humans, resulting in colour and shape change in wild species. Behavioural change is the objective of Simone Ciuti and her fellow researchers of the "landscape of fear." Only domestic animals have so far been investigated for a very obvious behavioural set of traits. Cervus elephas is harvested, but not from a domestic setting. Totally wild, the animals are sometimes bred for meat (venison), but normally roam free where the prairies or highlands or forests (one of their original habitats) allow. Radio telemetry using collars was employed with 2 year-old males that were long separated from their mothers and females aged 2-19 years. Ecologically, harvested males moved faster. The speed was greater near gravel roads and open areas and before the onset of the hunting season. The slower movement of the survivors obviously helped them to remain alive. The younger females moved faster and basically followed the same pattern and were harvested for the same reasons as the males. The probability of being harvested was linked to the males' selection of open areas, faster movement rate or flatter land. Females were also more vulnerable in open areas and with a faster movement rate. The younger females near to a road also had a higher chance of being shot. This means that shy hiders are survivors while bold runners are harvested. As no stags with "points"( the antlers) were used by the shooting humans, the obvious trophy aspect was absent from this study. Personality and temperament among wild creatures is now a subject for research because the bold/shy axis of behavioural response is a trait observed in almost all vertebrates so far studied. The risk taking and novelty situations used in studies correlate strongly with the shooting of elk. The human element creates the "landscape of fear" to which the animal responds with bold or shy mechanisms. As hunting mortality can often be higher than natural mortality from say, wolves, selection is going to take place in an artificial way. Undesirable results could include lack of bold animals for the hunter to find! This is an advantage for the elk, of course. It is hopeful that wolf and humans select for the same set of behaviours, but the rapid movement is likely to be one that is useful against the wolf, for example. Wildlife management is a relatively new science that needs a supply of data on which to act. The data on elk management now presents something of a dilemma. Will the wolf find it easier to select the new breed of shy elk, or will the two predations balance each other in the selection of the next generations of elk? At least the elk has been observed with plasticity in its behaviour enough to provide for various future threats. Other species are likely to become endangered when faced with the same double threat. The full research paper, Human selection of elk behavioural traits in a landscape of fear, is published today in the Proceedings of the Royal Society B: Biological Sciences.